In the last Post we saw the importance of some fruits and vegetables to our body,skin and most especially hair. It’s vital that we fix them into our diet and hair regimen. Blending them up into a smoothie with ice wouldn’t ever be a bad idea, or finding products that contain them in the ingredients or them homemade into our own hair products! 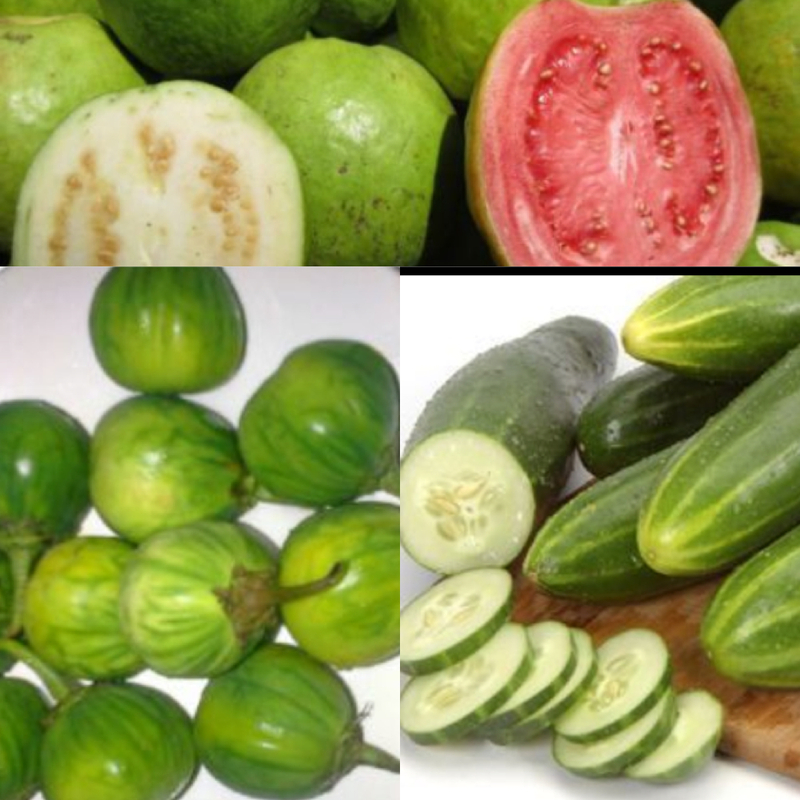 In this Post we will be looking at popular fruits and vegetables, especially if you live in the African region- Guava, Cucumber and Garden Egg/Aubergine/Egg Plant and how useful they are to our hair growth, skin and body in general. First is the Garden Egg (also called Aubergine or Egg Plant). It contains Vitamins C,B6 and Minerals. Vitamin C is very essential for hair growth as it helps in circulation in the scalp. The vegetable also contains Fiber,Potassium and Antioxidants. It promotes healthy complexion and also healthy hair…Also helps decrease risk of diabetes, obesity, and lowers weight! It can serve as a healthy snack, you could eat it raw (especially in place of junk ) or boiled. Eat a few raw daily. It promotes hair growth and helps combating “hair loss” problems!! Also another very good alternative snack to Junk. Blend with Carrots and/or Tomatoes into smoothie…Possibly have a glass daily. Look out for hair products that contain Guava. Finally it’s Cucumber (whoop whoop)!! A lot of people eat this vegetable, raw alone or in salads without knowing how helpful they can be to our hair and body in genera(I was guilty; Personally I cant stand the veg or the people who i see eating it but after gaining the knowledge, I try to at the most eat them in salads). Contains Beta Carotene just like the Carrot and is one of the best sources of Potassium. It releases Phytochemical which helps kill bad breath causing bacteria (so just incase you know someone struggling with that, it would be helpful to politely suggest this…). It Contains Vitamins B, rehydrates the body’s nutrients and helps cure hangover!! and Vitamin K for stronger bones. It contains Silicon, Sulphur Sodium and Calcium which contributes a great deal to hair growth and keeps the hair silky and shiny while conditioning it! It also fights cellulites, treats blemishes and tones skin. Caution: Pregnant and Lactating Women should seek advise from their doctors….